Following the sell-out success of last summer’s Royal International Air Tattoo at RAF Fairford in the Cotswolds, organisers say the 2016 airshow will be looking to the future – with the focus set firmly on the pilots, aircraft and technology of tomorrow. Details of the theme The Next Generation: Inspiring Innovationwere announced as specially-priced tickets for the three-day airshow, which takes place on July 8-10, went on sale this week for a limited period. Super Earlybird admission tickets, priced at £29 for the Friday and £39for Saturday and Sunday will beavailable until January 31, 2016. The prices represent a saving of more than 20 per cent off the cost of a standard admission ticket. All under-16s are admitted free of charge. In seeking to provide inspiration to the next generationand in keeping with its commitment to youth, Air Tattoo organisers are planning to stage official celebrations marking the 75th anniversary of the Air Cadet Organisation. 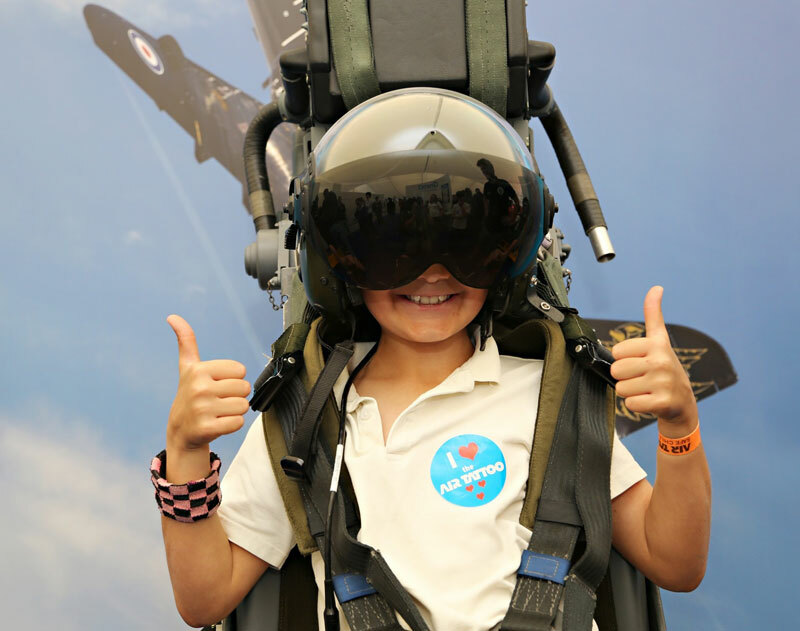 They will also be building on the success of the airshow’scritically-acclaimed Techno Zone and will offer even more children the opportunity to participate in the hugely popular Schools Engineering Challenge. Air Tattoo Chief Executive Andy Armstrong said the airshow was the perfect place to present a vision of the future of aviation as well as the technology that underpins it. The Royal International Air Tattoo is staged annually at RAF Fairford in support of the RAF Charitable Trust. To purchase Super Earlybird admission tickets and to view enclosure options, visit www.airtattoo.com. Free parking. 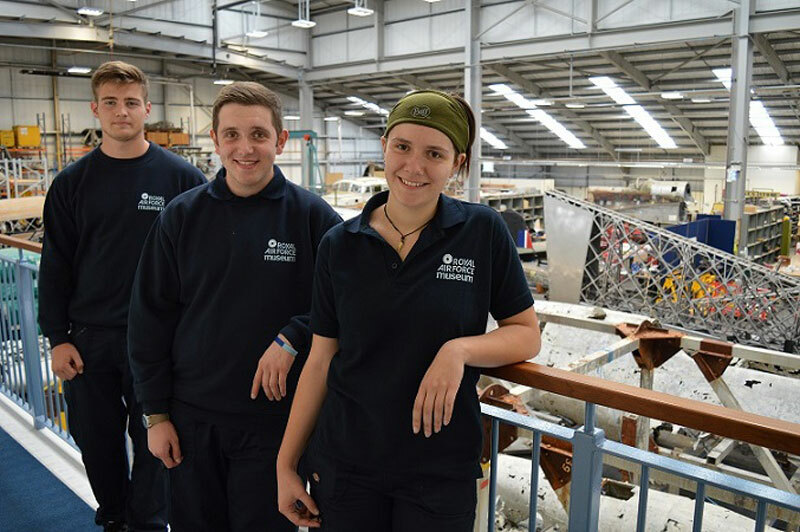 The Michael Beetham Conservation Centre (MBCC) at Royal Air Force Museum Cosford is delighted to welcome the arrival of three new Apprentices. The new recruits will join the Museums growing conservation team and multi award winning apprenticeship scheme, now in its tenth successful year. Adam Ellis aged 18 from Wolverhampton, Joshua Sault aged 17 from Brownhills and Maddie Whiting aged 17 from Bewdley recently joined the team which now has a total of six Apprentices. After starting their three year apprenticeship with the Museum on 1 September 2015, all three Apprentices are settling into the new working environment and have been partnered with a senior Apprentice who offers guidance and support. After only a few weeks in the new job Adam, Joshua and Maddie have already been busy working on test pieces of sheet metal, assessing their ability to achieve precision and accuracy whilst using various hand tools and materials. The RAF Museum Apprentices undertake all their hands-on heritage skills training in-house at the Museum’s Conservation Centre, where they each work side by side with a Master Craftsman who mentors them through their daily tasks. Many of the aircraft within the Museum’s collection are sole survivors and supporting documentation and procedures don’t exist. Museum Apprentices are encouraged to use their own initiative to develop, in consultation with their mentor, novel ways around complex and unusual engineering issues. This way of learning has been proven with past Apprentices to make them extremely capable, competent and self-confident individuals. Like those before them Adam, Joshua and Maddie will work on a wide variety of aircraft during their apprenticeship and will each be given a specialist project which may include some work on the long term restoration and conservation of the Museum’s Vickers Wellington and Handley Page Hampden Bombers. Over the ten years the Museum’s apprentice programme has been running, adjustments have been made to ensure our youngsters get the very best practical training and the associated support they need to give them the best possible start in their chosen careers. As well as working at the RAF Museum, this year’s new recruits are attending City of Wolverhampton College. At College they will learn modern Fabrication and Welding Techniques as well as studying the associated legislation and the supporting academics. At the end of year 1 they should have completed Performing Engineering Operations – Fabrication and Welding Level 2 and gained an Intermediate Apprenticeship in Fabrication and Welding. They will then move on to level 3 courses and work place vocational assessments leading to Level 3 Technical Certificate in Fabrication and Welding as well as their Advanced Apprenticeship in Fabrication and Welding. Aviation fans will be able to gain behind-the-scenes access to aircraft conservation work when the Conservation Centre opens to the public from 9-14 November 2015. Visitors will have a rare opportunity to view current projects and the chance to speak with the skilled Technicians, Apprentices and Volunteers about their work. Open from 10.15am – 1.00pm and admission is £5.00 per person. For more information on the Conservation Centre Open Week visit www.rafmuseum.org. · Anyone without a ticket should not attempt to travel to IWM Duxford on either Saturday 19 or Sunday 20 September as it will not be possible for them to gain entry to the air show. · Visitors who have purchased their tickets for The Battle of Britain Anniversary Air Show should allow plenty of time for travelling and follow the AA signs for the air show rather than sat nav. · Those who have tickets for the air show and are travelling by car should display the car parking passes in their car window to help ensure speedy parking and access to IWM Duxford. Those who may be disappointed by this news can still experience the build-up to The Battle of Britain Anniversary Air Show by visiting throughout this week as final preparations are made across the museum and aircraft practice their flying displays above the historic airfield. A flypast from the Battle of Britain Memorial Flight Spitfire will be a highlight for visitors attending a 75th anniversary event at the Royal Air Force Museum Cosford later this month. The Battle of Britain Weekend event taking place on 12-13 September includes a flypast both days from the most famous British fighter aircraft in history. Spitfire’s won immortal fame during the summer months of 1940 by helping to defeat the German air attacks during the Battle of Britain. The unmistakable Spitfire sound and silhouette will be filling the skies over Shropshire at 4pm on Saturday 12 and 11.25am on Sunday 13 September as it flies overhead at the Museum. Visitors can also view the world’s oldest Spitfire displayed next to a Hurricane in the Museum’s ‘War in the Air’ hangar at Cosford. Activities taking place over the nostalgic weekend include real life working Leonides, Bristol and Griffon engine demonstrations and a chance to see how a WW2 RAF Ops Room operated during the Battle of Britain era, brought to life by re-enactors. There will be live music on both days including performances from Marjorie Cartwright-Jones in a 1940s Home Front Cabaret and Miss Fortunes, a singing trio who will be resurrecting the wonderful hits of the Second World War. A musical treat for visitors on Sunday 13 September will be a performance from the Glebe Symphonic Winds Orchestra. The performance will include many well-known favourites such as the Dambusters March, Barnes Wallis March and RAF March Past. Organisers have also lined up a fascinating talk on Sunday 13 September, entitled ‘Battle of Britain: Myth and Reality’ with historian, writer and broadcaster James Holland. In this talk, James takes a fresh look at one of the most iconic episodes in British history, examining the story that has been passed down into folklore and assessing the performance of both sides. In doing so, he will be asking whether Britain’s victory in the summer of 1940 was even more comprehensive and significant than perhaps is widely thought. To keep the children entertained, families can step back in time into a 1940’s classroom and learn about pounds, shillings and pence arithmetic and fill in a replica evacuee label and identity card whilst answering to a strict old fashioned teacher. But be ready for the air raid siren as it may go off at any time! Other children’s activities include the chance to build a 1:72 scale Airfix model Spitfire and Battle of Britain colouring sheets for the little ones. Families visiting on Saturday can enjoy storytelling sessions and hear about the brave men and women who took part in the Battle of Britain – find out who they were and the sorties in which they served. As a memento of your visit, families can visit our wartime photo booth and delve in to our dressing-up box of RAF uniforms and aviation accessories and then pose for pictures. Each participant will receive a printout of four photos to take home for the family photo album. Visitors wanting some hearty food will be spoilt for choice in the Refuel Restaurant as they chose a meal from the wartime menu and dine in the street party setting, soaking up the wartime atmosphere. For further information and timings of events visit the Museum website www.rafmuseum.org/cosford or call 01902 376200. The Museum is open daily from 10am and entry to the Museum is FREE of charge. To mark the 75th anniversary of the Battle of Britain, a Eurofighter Typhoon from 29 (R) Squadron and a Spitfire from the Battle of Britain Memorial Flight will take to the skies together for a remarkable flying display as part of The Battle of Britain Anniversary Air Show on Saturday 19 September. This award-winning display presents the iconic fighter aircraft that defended Britain’s skies 75 years ago alongside the contemporary fighter aircraft that has the same role today. The state-of-the art Typhoon fighter jet is painted, for 2015, in a Battle of Britain-era colour scheme to acknowledge the bravery and sacrifice of the aircrews who took part in the battle 75 years ago. RAF Coningsby Station Commander, Group Captain Jez Attridge said, “This fully operational Typhoon will be a dynamic reminder to all that see it over the summer of the link between the modern Royal Air Force and The Few that defended our nation 75 years ago during the battle. Today that mission endures with Typhoons on Quick Reaction Alert, every minute of every day. The RAF’s Quick Reaction Alert Typhoons defend the UK against potentially hostile aircraft approaching the UK sovereign airspace.” Group Captain Attridge added: “The technology has changed since the Battle of Britain but the mission for the RAF to protect the UK remains unchanged”. The Eurofighter Typhoon is a highly capable and extremely agile multi-role combat aircraft, capable of being deployed in the full spectrum of air operations, including air policing, peace support and high intensity conflict. The Typhoon Display is flown by 29 (Reserve) Squadron from RAF Coningsby. It showcases the incredible performance of the aircraft and also demonstrates the dedication, professionalism and excellence of the RAF personnel who fly, maintain and support Typhoon operations in the UK and across the world. The agility, power and aerodynamic styling of the Supermarine Spitfire made it the best-known fighter aircraft of the Battle of Britain. The Spitfire is synonymous with Duxford, as it was here that the first Spitfires came into service in 1938. The Spitfire was produced in greater numbers than any other fighter aircraft of the Second World War and was the only fighter aircraft to be continuously produced throughout the Second World War. The Battle of Britain Anniversary Air Show (Saturday 19 and Sunday 20 September) will be an immersive and poignant experience for everyone. Flying displays, including a massed flypast of Spitfires, will be combined with wartime music and the voices of men and women who served. Living history groups will recreate the daily life of RAF Duxford as a Battle of Britain Fighter Station in 1940. The flying display explores the development of the Battle of Britain and its significant role in the Allied victory of the Second World War. The beginning of the Battle of Britain is commemorated by a Spitfire scramble. Hispano HA-112 MIL (Buchon) aircraft fly in and as the scramble bells sounds, living history interpreters representing RAF fighter pilots race to the airfield and Supermarine Spitfires chase off the enemy aircraft. Visitors will hear the audio memories of Battle of Britain pilots, recalling waiting to scramble and the exhilaration of the dogfight. The sacrifice made by Battle of Britain pilots and the feat of winning the Battle is commemorated with contemporary displays including the Red Arrows (Sunday only) and the Aerostars (Saturday only). The Battle of Britain Anniversary Air Show takes place on Saturday 19 and Sunday 20 September and tickets are only available in advance. Tickets are now only available for Saturday 19 September. Online booking will close on Sunday 13 September. Tickets can be purchased in person at IWM Duxford and IWM London until Friday 18 September. 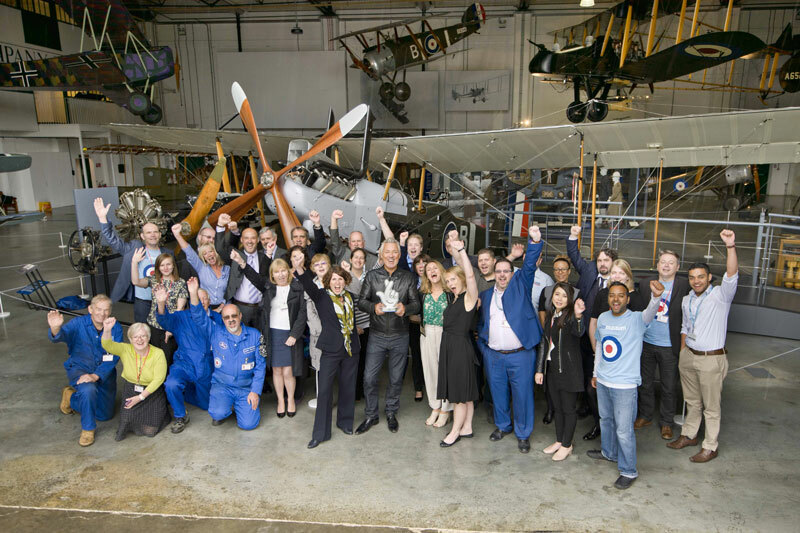 Today (Tuesday 1 September 2015) musician and actor Martin Kemp presented staff at the RAF Museum in Colindale with a National Lottery Award trophy. The star of Spandau Ballet hits like ‘Gold’ and ‘True’ famously took to the skies back in 2008 for Martin Kemp: The Battle of Britain. As part of a TV series the daredevil boarded a World War II fighter plane to recreate a Battle of Britain dogfight. Today it was his turn to try out World War I planes instead- albeit on the ground! Martin took time out from tour preparations to help staff at the RAF Museum celebrate its award-winning exhibition. The museum’s First World War in the Air exhibition received over 7,000 votes to be named the UK’s Best Heritage project in this year’s National Lottery Awards – the annual search to find the UK’s favourite Lottery funded projects. The museum wins a £2,000 cash prize, an iconic National Lottery Awards trophy and will attend a star-studded Awards ceremony, The National Lottery Stars, broadcast on BBC One on 21 September. The Royal Air Force Museum’s popular First World War in the Air gallery brings to life the compelling stories of the people, innovations, engineering and aircraft of the Great War. Over 65,000 people have visited the exhibition in the last six months, with thousands more accessing information on the Museum’s websites. Sunshine, rain, sad farewells and poignant tributes all contributed to the overwhelming success of the eleventh Wings & Wheels on Saturday 29th and Sunday 30th August. Over 38,000 people visited the historic airfield to support and celebrate the best displays in aviation and motoring. A poignant tribute was held each day to remember those affected by the Shoreham tragedy as the Show paused for a minute’s silence at the start of the air displays. The Kittyhawk flew gracefully across the aerodrome to signal the end of the silence and open what was the best air display the Show has had to date. The Typhoon Display Team didn’t disappoint as the impressive jet roared through the skies. 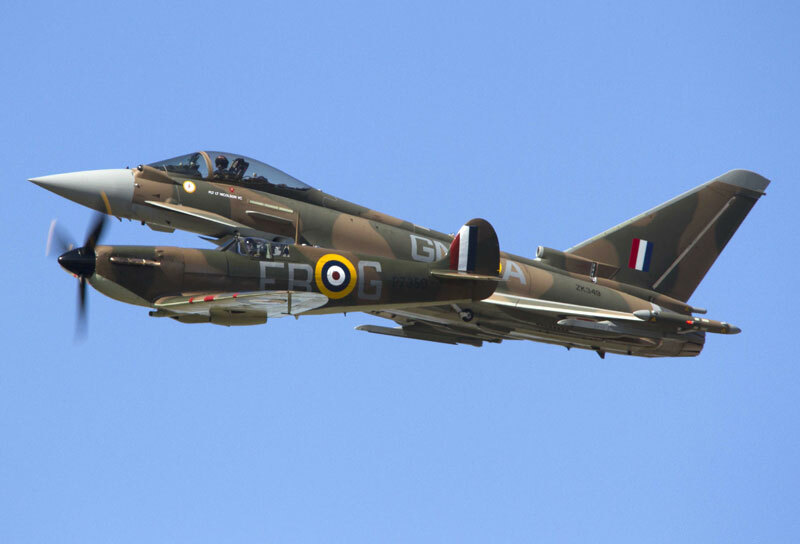 The state of the art jet flew first in a solo display then as part of a Synchro Pair alongside a WWII Spitfire bringing together old and new in a commemoration of the 75th anniversary of the Battle of Britain. Once again the Red Arrows showed why they are the best in the world as the sky was filled with their red, white and blue smoke. And then the Hawk T2 demonstrated why the aircraft built at Dunsfold is still a world class fighting machine with their role demo and display of firepower. Crowd favourite the RAF Chinook helicopter defied gravity and showed of its versatility and manoeuvrability. The RAF Tutor demonstrated why the aircraft is so good for training future pilots and the Tigers Freefall Parachute Display team dropped into the Show with their customary precision before meeting visitors and showing how to pack a parachute. The Vulcan howled an emotional goodbye to the crowds on Saturday but bad weather forced her to abort on Sunday. The history of the aerodrome was evident in the skies with the Dutch B-25 Mitchell Bomber, the Battle of Britain Memorial Flights Spitfire and Hurricane, the DC3, Mustang and, for the first time at Wings & Wheels, the moving tribute that is the B-17 Flying Fortress The Sally B. The Blades, Breitling Wingwalkers, Turbulent Team, Glider FX, MiG 15, Jet Provost and Richard Goodwin showcased the skill of civilian flying. Brooklands Museum once again showed off some of the most exotic and outrageous machines around, from its own collection and from dozens of private owners in the Motoring Demonstrations. Spectators watched an eclectic mix of vehicles from vintage classics to modern favourites blasting down the famous runway in full view of the crowd line. Amongst machines that made their Dunsfold debuts were Lorne Jacobs’s exciting new evocation of Sir Malcom Campbell’s Blue Bird land-speed record car on the 1920s and, in total contrast, the 760HP Tesla P85D electric car capable of accelerating from 0-60MPH in around 3 seconds and a top speed of 155MPH in near-total silence. Aero-engined favourites, Robin Beech’s 27-litre Handlye Special and John Dennis’s 1907 Berliet Curtiss, and modern supercars including Lamborghini Aventadors and Huracans, a Ferrari LaFerrari, Maserati MC Stradales and McLaren 650S. Slightly older, but no less impressive, was the Jaguar XJ220S (the fastest production car of its day), a NASCAR racing Chevrolet Impala and a trio of Plymouth Superbirds. Elsewhere on site, the Wheels Zone featured special interactive displays from Transformer Car Hire who brought along their Transformers motion picture replicas. The car clubs had over 300 vehicles including the Jaguar Enthusiasts, Muddy Diffs Overland, MX5, Skyline Owners Club and DS3 Club. And for the first time since its retirement from RAF service in 2013, Brooklands’s Vickers VC10 airborne tanker made a public appearance with a full-bore-acceleration taxying demonstration on the Sunday. The Military Zone was brimming with history as re-enactment groups and a collection of over 80 military vehicles exhibited on the Second World War aerodrome. Tanks were new to the Zone as visitors not only got to ride them but experienced the awesome firepower of the 1943 T-34 which fired to signal the start of the military vehicle parade each day. As the last plane touched down the party started across the arena with a mix of musical evening entertainment with Champagne Blitz, a 1940s songbird trio armed with smooth harmonies, seamed nylons and lots and LOTS of red lippy and the Rocking Rebels who jived through some classic 50s rock’n’roll. Wings & Wheels were joined by Help for Heroes, Brooklands Museum Trust and Age UK Waverley, all charities that the Show supported through a variety of initiatives. Aviation fans can experience the virtual skies this autumn as the Flight Sim 2015 event heads to the Royal Air Force Museum Cosford in Shropshire. 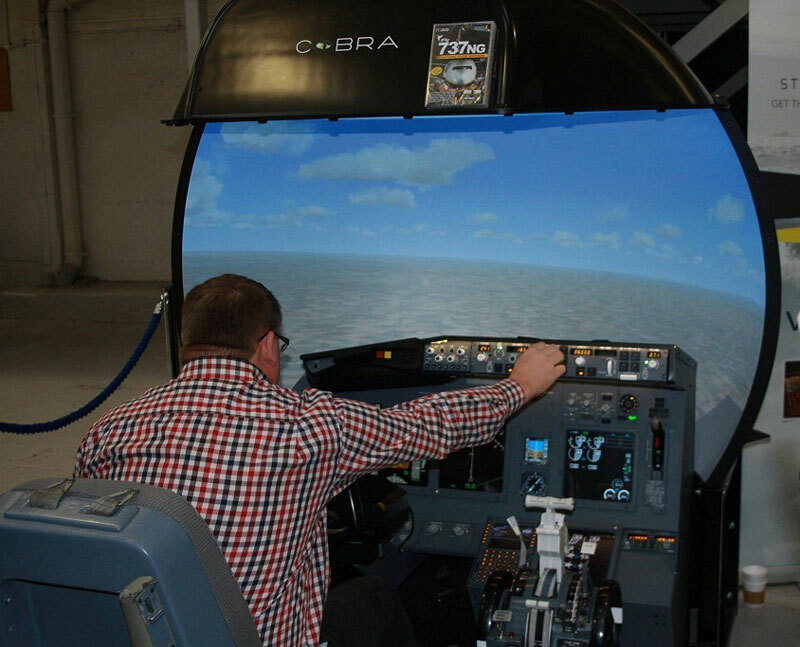 Taking place on Saturday 3 October, aviation enthusiasts will enjoy a day packed with all the latest flight simulation software and the chance to test out their virtual flying skills. After two very successful shows held at the Museum, the UK’s largest Flight Sim show will be returning to Cosford for an even bigger and better event. Just Flight, one of the UK’s leading flight simulation software publishers, will be hosting this major gathering in association with PC Pilot magazine to show visitors the very best in desktop flying. Building on the success of previous events, organisers are anticipating in excess of 1,500 visitors will attend the one day show. Visitors attending the Flight Sim 2015 event this autumn will experience the best of both, the virtual world and the real world of aviation, as they explore the world class collection of aircraft and exhibitions on display at the RAF Museum Cosford. Advance tickets for Flight Sim 2015 are now on sale online for just £7 per person, with free entry for under 16s accompanied by an adult. Tickets purchased on the day cost £10 per person. For further information on the event or to purchase your tickets in advance, please visit the show’s website www.flightsimulatorshow.com. To cope with the additional visitors, a free park and ride will operate from Cosford Train Station with regular pickups throughout the day. Entry to the Museum is free of charge and on-site parking is available (charges apply). Entry into Hangar 1 on Saturday 3 October will be for Flight Sim 2015 ticket holders only.